On April 2nd, Surfrider Foundation Vancouver Island gathered a group of experts to help us satisfy our curiosity about compostable plastics. We learned that “compostable” is a misnomer. 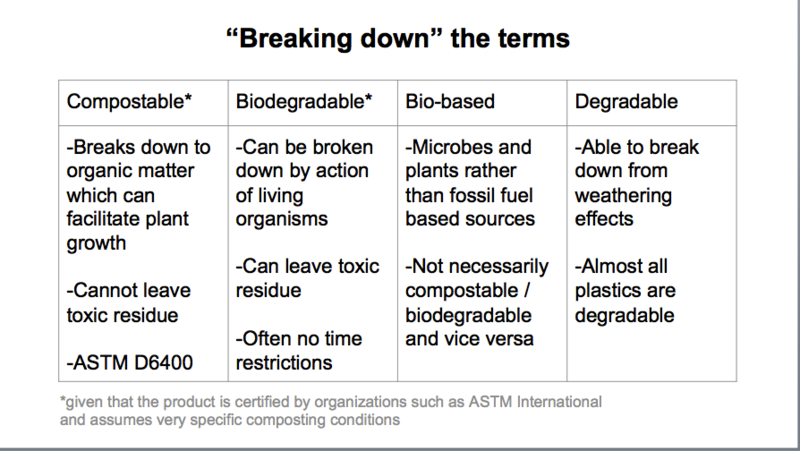 Compostable plastics (typically plastic material made of PLA or polylactic acid) require a very specific set of conditions to break down, and most industrial composting facilities can’t provide those conditions. Most compostable plastics never make it to a composting facility at all. They end up in landfills or contaminate recyclable plastic streams. Even when compostable plastics do arrive in an industrial composting facility, they don’t break down completely, and they become a nuisance to facility operators and a contaminant in finished compost. Noah Snell is a student researcher from UVic who assisted Surfrider in our compostable plastic research this past year. He starts by breaking down some industry terms. He noted that to pass the standard, a CP item must degrade within 180 days when held at 58ºC and exposed to an inoculum (that is, some hardworking compost microbes from a site where compostable plastics is already decomposing) derived from a municipal waste stream. Very high heat and moisture must be maintained to make this happen. Noah’s research revealed that compostable/biodegradable plastics will not degrade in any other conditions, including marine environments, landfills, or home compost systems. Therefore, they pose the same challenges as conventional plastics. They are more expensive, but not better. He suggested that paper products are compostable, but they share the same issue as compostable plastics and conventional plastic, in that they are still single use. Emissions are created and energy used in the production of every product, and when the product is only used once, it is wasted. Jack Vanderbasch is the manager of Coast Environmental in Chemainus. He has one of only two industrial composting facilities on Vancouver Island. He told us that he accepts compostable plastic mixed in with regular compost, but if there’s too much in a load, then it goes to the landfill. Jack has two massive barns held at a minimum of 65ºC (up to 89º) and very high humidity, full of mostly high quality vegetable matter. Most of the compost that goes in there is fully composted after 43 days and ready to be a saleable product after an additional three months of curing. The compostable plastic, however, is shaken out and passed through the composter two or three more times before it degrades enough to be unrecognizable as plastic. Three or four cycles is often not enough, but at that point it is separated from the rest of the compost and sent to landfill. Produce stickers, Jack commented wryly, are the “bane of his existence”. He can’t effectively separate them, so his end product may be very high quality potting soil, but still contaminated with indestructible little plastic stickers. Chet Phillips was co-founder and director of a student-operated, industrial scale composting initiative at the University of Arizona, Tucson for 8 years prior to his current position as executive director of the Compost and Conservation Education Centre. His previous operation, Compost Cats (for the Arizona State Wildcats), was the only municipal composting facility for the City of Tucson. They tried everything they could think of, he said, to get the compostable plastic to break down. Heat, moisture, varying feedstocks – but, despite the effort, they spent hours each week picking bits of “compostable” bin liner bags and serviceware out of compost piles. In this interview on CBC Radio’s On the Island program, he pointed out that bin liners aren’t necessary. Just put your compost straight into the kitchen catcher and dump that into the green bin. If you absolutely must use a liner, buy mushrooms and keep your scraps in the paper bags that they come in, or use folded newspaper or paper leaf collection bags. Paula and Nairn McPhee are owners of the Zero Waste Emporium on Douglas St in Victoria. They are committed to living a zero-waste life. They say to be prepared and bring your own dishes. Never accept single-use anything. There is no rule or regulation that prevents businesses from allowing you to use your own containers. Despite that, they have sometimes been told “no” by salespeople when they try to bring their own containers. They suggest being polite and persistent, since there is no legal basis for refusing. If customers continue to ask for it, businesses will allow it. However, in cases where single use packaging is absolutely necessary, they suggest several alternatives. Compostable, recyclable, sustainable and cheap. A natural waste product of sugar cane extraction, performs similarly to paper pulp products but can retain liquids longer before getting soggy. It is about as expensive as PLA products. Made of tapioca, bamboo chopstick manufacturing byproduct, and plant cellulose. It is backyard compostable within 2-3 months. Made of wood, cotton or hemp cellulose. It was invented in 1908 and is entirely backyard compostable. It performs like plastic, and though it’s a little more expensive than polypropylene, can be used as a food wrapping. Cupclub in the UK provides a returnable cup service in airports, university campuses, events, coffee shops, large office buildings, etc. Lids are purchased, cups are borrowed. Tops and bottoms can be microchipped and tracked. Patrons can return cups to several convenient locations Cups are collected, cleaned and distributed daily. In a dense area with a rich food culture like Victoria, a returnables program could be very successful. In fact, a few local businesses such as Bliss and Parachute ice cream are already selling products in returnable Mason jars. We’ve focused on food packaging because that’s where compostable plastic seems to be in use so far. Now that we’re aware of the problems with this material, we hope to discourage its spread to other industries. The idea of compostable plastic is hopeful because it lets us think that we can continue our current insane rate of consumption and waste with no consequences, if we simply switch to a different type of material. But we’ve learned that this isn’t true. The City of Victoria is currently developing a new Zero Waste strategy. They’ll make recommendations for local businesses about single use items, and we hope that no exceptions will be made for compostables. Compostable plastic is still just plastic, and in the words of Jack Vanderbasch, “plastic is drastic”! For a truly sustainable city, we need to stop using all types of single-use plastic, including compostables.